HAPPY PRIDE MONTH, EVERYONE - THERE WILL BE A SEQUEL TO CARRY ON. I haven't felt this much hype about a book release since my Harry-Potter-midnight-release days. It makes sense, when Carry On was first released, many people complained that it was just HP fan-fiction. It's so much more than that, though! Rainbow Rowell took the best elements of Harry Potter and expanded on them (and added some twisty parts to make it her own unique and incredible universe). The world Rainbow Rowell has created in Carry On is what Harry Potter could have been - where mental health is explored and treatment is encouraged, where boys are allowed to cry and they are comforted because boys are also human beings and all humans have emotions, where friendship is important but personal identity outside of friendship is equally as important, and where being queer isn't a "fun fact" about characters IT IS A REALITY FOR MANY PEOPLE. 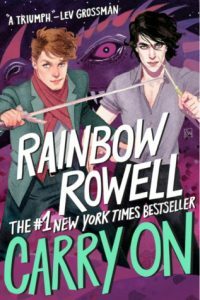 The characters in Carry On first appeared in Fangirl,which is about a young college student named Cath who copes with being away from home for the first time by writing fan-fiction of her favorite children's fantasy book series, Simon Snow. 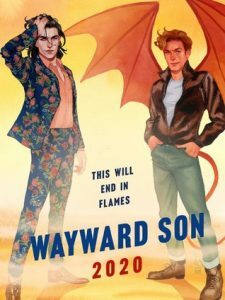 The series is about a magically talented boy who gets whisked away to the Watford School of Magicks where he learns that he is the Chosen One - the savior to all of magic. ADVENTURES ENSUE. Cath's fan-fiction is all about the relationship between Simon and his roommate, Baz. In the official books, Simon and Baz hate each other. In Cath's recreation of the world, Simon and Baz are madly in love. The fan-fiction is such an integral part of Fangirl that Simon and Baz feel real. 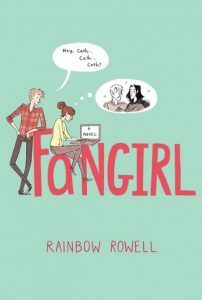 Rainbow Rowell loved Simon and Baz so much, she wrote them into their own standalone book. Then there is Tyrannus Basilton Grimm-Pitch, aka Baz. Oh, Baz. Baz is so complicated and wonderful and sometimes really, really terrible. He is a precious little flower (but the poisonous kind of flower that might just kill you if you're not careful). His backstory is just as heartbreaking as Simon's, which explains why he is the way he is. In any other story, Baz would be the "villain," but in this story he's just a boy--a dreadfully melancholy and sarcastic boy who is desperately in love with his roommate, who just happens to hate him. The way Simon and Baz's relationship develops from not-quite-sworn enemies to something much, much more is gorgeous. Their relationship will break your heart and then warm it. Simon and Baz are everything - I love them with all of my heart. Carry On isn't just about two boys kissing, though! It is a fantasy story, after all. The magic system is something I have never seen before. Language is particularly important within this universe, because all magic relies on clever wordplay. Mages must use their knowledge of words in order to successfully cast spells. Language is ultimately the greatest power. What a brilliant way to convey magic - through words. Healthy friendship as a concept is also explored within the pages of Carry On. Simon's best friend is Penny. She is dead clever and stupidly brave. She would do literally anything for Simon because she loves him so much in a "I choose you as my family" kind of way, not "I am secretly in love with you" like many stories go. Their friendship is one of the best parts of the novel. Agatha also plays an important role in the story - she starts off as Simon's girlfriend but they quickly break up, and from there she forges her own identity. She isn't quite sure who she is just yet, but she's getting there. The girls are both so fascinating and they are never relegated to the sidelines. I have read Carry On three times since Wayward Son was officially announced on Twitter earlier this month. I can't stop picking the book apart and analyzing the characters and their actions and oh I just love this book so much. 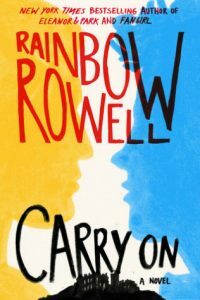 Like most of Rainbow Rowell's books, Carry On is heart-wrenching and beautiful and life-affirming and comforting and oh-so-magical. It has been such a joy to rediscover this book. I highly recommend you give it a chance if you've never read it. If you have read it, well, now might be a good time to read it again. Maybe your heart will feel full, too.